I will prepare a customized menu to suite your specific taste and that is sure to satisfy your guests. 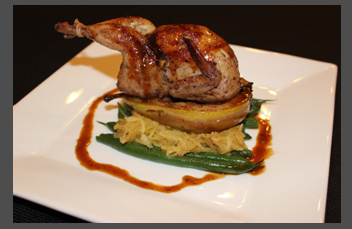 Multi-course meals are based upon your choice of any domestic meat, fish, or poultry. For more adventurous meals, I encourage you to choose wild game courses such as Venison, Elk, Caribou, Wild Boar, Quail, Duck, Pheasant, or Rabbit. Below are a few sample menus for a typical dinner. I will provide wine and liquor paring recommendations with every menu. "Bobbie is a true Gem!!! Her cuisine is exquisite and her presentation is flawless. Her set ups are elegant and sophisticated, with an attention to detail in her food and decor that create such a fun, comfortable and beautiful experience. Her dishes are as mouthwatering and delightful as they are pretty to look at. Thank you Bobbie, for being so talented and introducing me to a broader world of delicious food, you are a pleasure to work with and a fabulous and creative Chef!"